Welcome to the Broker-Carrier Marketshare Database - Welfare GOLD EDITION, a service of Judy Diamond Associates, Inc. hosted by FreeERISA.com. This help section will provide you with guidance in getting the most out of our new, improved marketing tool. Before gaining access to BCMS Gold, you must sign up for it. This applies even if you have already purchased standard BCMS or other JDA products. The easiest way to gain access to is to call our knowledgeable sales staff at 800-231-0669. 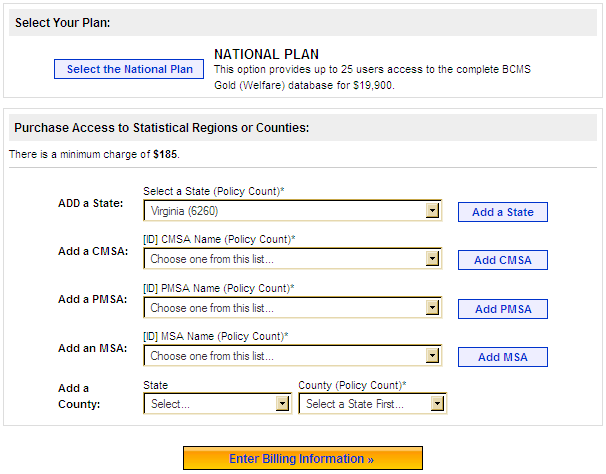 Here, you can purchase the entire database by clicking Select the National Plan or customize your purchase by state, county, or metropolitan region. For more information on metropolitan regions, see the Glossary. Please note that these regions refer to where the plan sponsor is located, not to where the broker(s) or carrier(s) have offices. For more information on geographical distinctions in BCMS, please see the Search Section. Once you�ve made your selections, click �Enter Billing Information�. You will be asked for your billing address and email. Then click �Confirmation & Payment�, where you will be able to view your order information and edit your address or selections if you wish. When you are satisfied with your order, enter your payment information or select �I will contact you later with my payment information�. Click �Finalize Your Order� to purchase. You will then receive an email with the details of your purchase that will also contain your password to BCMS Gold. You�ll need this password each time you login to BCMS Gold, so be sure to keep a record of it! If you paid by credit card, you can start using BCMS Gold immediately. If you selected �I will contact you later for with payment information� a JDA representative will contact you shortly to activate your account. Once your account is active, you�re ready to start searching! Go to www.freeerisa.com/BCMSGold and enter your email address and the password you received into the login box on the upper right. Click �Go� to login. Once you�re logged in, you�ll see your account information at the upper right. It will include your expiration date and the dataset to which you have access. This information will appear on every screen. You can jump right in and begin searching here, or click on Advanced Search at the top for more options. For more information on searching BCMS Gold, please see the Search Section. On subsequent visits, upon logging in you will see whatever search screen you last used, with your most recent criteria populated in the fields. You�ll also have the option to call up searches you�ve previously saved. See the Saved Searches section of help file section for more information. Each of these sections have different options that you can populate either by selecting an item from a provided list (like Plan Type or State) or a blank field you can type a value into (like Broker Name or Premiums). It is possible to populate boxes from more than one of the four different sections. Doing this will provide you with a more targeted set of results. 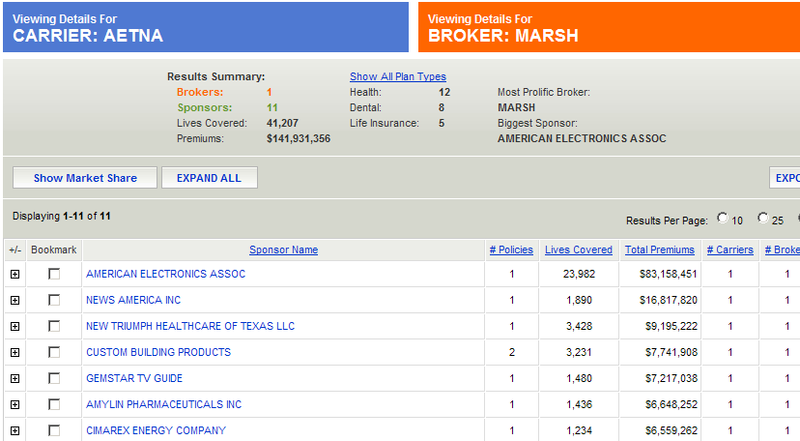 For example, you can search for companies that have Health policies through Cigna that were brokered by Marsh. Alternatively, you can just search for companies with a health policy and then filter by �Cigna� and �Marsh� on the subsequent result screens. 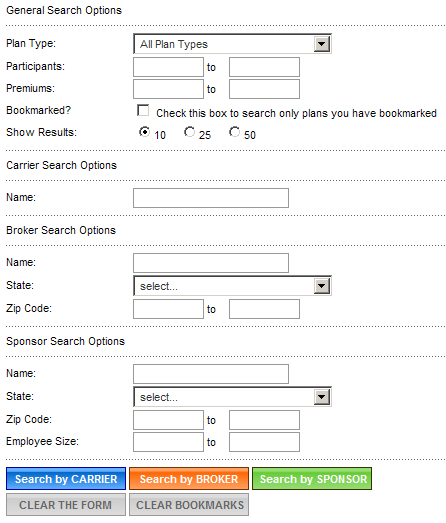 When searching by the name of a Carrier, Broker or Sponsor, our database will try to match your search query exactly. You may know a company as �John�s Tires and Auto� but if they file their form 5500 as �John�s Tire, Muffler and Automotive� your search for �John�s Tires and Auto� will not find any results. A search for �John�s Tires� will, because you�ve given the database more leeway to find results by being a bit less specific in your search. You will not need to enter commas or dollar signs in your number (so 570000 instead of $570,000). The database is sold by geography based on the location of the plan sponsor, so if you bought the state of California you will have info on the employer groups located in California and the brokers and carriers who are servicing them, regardless of the location of the broker or carrier. To select more than one data element from the same field (for example, Plan Type Life or AD&D) you will need to click on the Advanced Search Screen. Your search will return a set of policy data that has brokers, carriers and employer groups (which the government refers to as �Plan Sponsors�). How you initially view that data is determined by you when you click one of the three search buttons. Clicking any one of these buttons will execute your search, but which button you press will have an impact on how you will view the results of that search. Clicking on the �Search by Carrier� button will take you to a carrier-centric view of your data, while the �Search by Broker� button is best if you�re looking to do research on brokers. If you decide you need to see things from a different perspective, you can simply click one of the �View by�� buttons available from any results screen to change your view. See the next section, �Filtering� for more information on how to manipulate your search results. If the Basic search isn�t flexible enough for you, try our new Advanced search option. Click on the Advanced Search button at the top of the Basic Search screen to start. Some functions are the same: you�ll see that you still have the option to Search by Carrier, Broker or Sponsor, buttons to clear your bookmarks and reset the search form, and an option to set the number of results per page. This search would show you all Brokers whose name begins with �Ma�. If you want to search by more data items, hit the �+� button next to your first item and a second line will appear. You can add as many rows as needed, but you will need to fill in each row before you can add the next. To remove a row, simply click the �-� next to it. You�ll notice that each line after the first has an additional dropdown item at the front: the And/Or box. More on this below. If you wanted to find all health plans in NY, NJ and CT using the Basic search, you would have to run three different searches because you can only select one state at a time. The Advanced search allows you to search for multiple variations of the same data field, so your search for health plans in three states becomes possible. The key to this function is the And/Or box you see at the beginning of every additional search line. You need to be sure you�ve selected the right option in that dropdown as you add new items to your search. AND Searches tell the database to search for any instance where both Condition A and Condition B are true for the same policy. OR Searches tell the database to search for any policies where either Condition A or Condition B is met. Let�s look at an example. Searching �Plan Type = Health� and �Plan Type = Life� returns only those policies that contain both a Health and a Life component (about 3,200 sponsors). Now if we search �Plan Type = Health� or �Plan Type = Life�, we get all policies that have either a Health or a Life component (about 43,000 sponsors). In other words, changing a little word can make a big difference in a search. For instance, searching for �Broker State = NY� or �NJ� or �CT� returns 2448 brokers, while searching for Broker State = NY and NJ and CT returns NO results at all. This field allows you to specify whether or not the selected data item appears in any of the policies. For example, if you wanted to find all policies that didn�t use a broker you would select �Broker Name� + �Does Not Exist� and then whatever other search criteria you�d like to narrow down the results. New to BCMS Gold is the option to save searches for later recall. In order to save a search, simply go to the Basic or Advanced Search page, enter any criteria you desire and hit Search (by Carrier, Broker or Sponsor). On the results screen, click on the �Save This Search� button at the top of the page. You�ll be taken to a page that shows you the criteria you searched for, along with a place to Name your search. Enter a name for your search (i.e. Health plans in NV & UT) and then hit Save My Search. This will bring you to a list of your saved searches. If you wish to reload a search later, click on Saved Searches at the top of any search or results screen. Clicking on the name of the search will run that search and bring you to the results page. Similar to the �Search by� buttons on the basic and advanced search screens, the top-level results screens will have �View by� buttons on the top right. So, if you chose at the search screen to view your results by Carrier and would now like to see your results in a Sponsor-centric way, simply click View By Sponsor. The data behind the results will be exactly the same; you�ll just be grouping things by Sponsor instead of Carrier. At the top of all results screens, you will see summary information that displays aggregate data based on your search. Among the items listed here are the total number of Health, Dental and Life Insurance policies in your search. If you�d like to view all the plan types and their totals, simply click Show All Plan Types to bring up a full list. IMPORTANT: Remember, this feature calculates market share specifically based on your search criteria, so that the total market share will always be 100%. You could easily do two different searches and get two different sets of market share data for the same company, because your second set of results includes a different universe of companies. Make sure you�re always comparing apples to apples by taking advantage of our �Save Your Search� feature. The database will default to sorting by the Total Premiums column where available, showing the largest numbers first. Once you�ve conducted a search by Carrier or Broker, you�ll notice that the resulting carriers and brokers are links that can be clicked on. If you click on one of them, you will set that item as a filter, and the rest of the data you view will relate back to that item. For example, if you click �United Healthcare� from the carrier list you will see a list of brokers who are selling United Healthcare products. All of the information on brokers, premiums, lives covered etc. will be tied to United Healthcare. You are free to click again from this screen to narrow your results down to the Single Carrier / Single Broker level. The series of screen shots below show a typical use of this feature. Notice how each new filter is prominently displayed at the top of the screen. Once you�ve clicked on a single broker or single carrier, as shown above, you�ll notice some additional options on your results page. First of all, on the upper left, you�ll see 2 new View By buttons, one of which will be grayed out. If you�re on the Carrier screen, these will read Broker and Sponsor; if you�re on the Broker screen, they�ll read Carrier and Sponsor. Basically, even with a filter on, you can still choose which way you�d like to group your results. If you want to see all the sponsors that work with United Healthcare, you can click the sponsor button. To see all the brokers that work with United Healthcare, you can click the broker button. Brokers: Will show any broker agents that work for that brokerage firm on policies in your results set. Sponsors: Will show broker firms that work with that Sponsor on policies held by the Carrier you�re focused on. Carriers: Will only show top 2 plan types. Sponsors: Will show Carriers that appear on that Sponsor�s policies with the Broker you�re focused on. The Sponsor Detail Screen, which you will see if you click on a sponsor name anywhere in our database, has some unique features. At the top of the screen, you�ll see the sponsor�s name along with their address. Underneath that you will see the Carrier Timeline: a new feature. This shows you all the carriers that have worked with the sponsor since 1999 in an easy to read chart. If there are more than 3 carriers in the timeline, click Show All Carrier Timeline Data to see the full chart. Once you�ve expanded the chart, you can collapse it again by clicking the �Show First Three Timeline Entries� button. Below the Carrier Timeline is a list of all of the Sponsor�s plans, with the accompanying information. Clicking on any Plan Name will bring you to the 5500 for that plan. Another new feature of BCMS Gold is the ability to bookmark individual Plan Sponsors within the database. This will allow you to screen later searches to only show plans you�ve marked. You can bookmark sponsors on the Sponsor General Results screen or the Carrier or Broker Detail screens (organized by Sponsor). To bookmark a sponsor, click in the tick box to the left of the sponsor�s name. The bookmark will be saved automatically. You can bookmark as many sponsors as you like. To view bookmarked sponsors later, go to the Basic Search screen and check the Bookmarks box, enter any other criteria you�d like to search by, and then run your search. Only sponsors that you�ve bookmarked will show in your results if you check the Bookmarks box. You can also go to the Advanced Search page, select �Bookmarked Plans� in the dropdown, and set the Comparison dropdown to Is True or Is False. This way you can either include or exclude bookmarked sponsors in your search. If at any time you�d like to clear a single bookmark, you can just uncheck the box next to that sponsor on your results screen. If you�d like to clear ALL of your bookmarks, simply click the Clear Bookmarks button on either of the search screens. It requires only a few clicks to export information from BCMS � GOLD into Microsoft Excel or any other database program. Begin as always by running a search. Once you have your results, click the �Export� button located on the right hand side of the screen. This will bring you to the Export Center. Here you will have two different types of export available to you; the Summary Report and the Detailed Report. Whichever option you chose will only export data based on your most recent search. Please note that only the checked fields will be exported. You can choose to organize your export by Carrier, Broker or Sponsor. The Summary Report allows you to export aggregate information on brokers, carriers or sponsors. This export will contain one and only one line for each carrier or brokerage firm which sums up all of the policies they are involved with. This sort of report is extremely useful for market share analysis, but is not designed for contacting individual agents. Use the Detailed Report if you are looking to produce a dedicated contact list. The Detailed Report allows you to export information on individual insurance policies and the brokers, carriers and sponsors involved. Here you will find information on individual agents and their clients- rather than seeing data tied only to the agent�s firm. You must also select your preference on broker repetition. By default, �Repeating/All Brokers� will be selected, but what does this mean? The key to understanding this option is to be aware that some insurance policies contain data on more than one broker of record. As long as the broker was paid a commission, they must be disclosed on the Schedule A. This leads us away from a nice and neat �One carrier ties to one broker ties to one sponsor� relationship. Instead, we can have one carrier tied to many brokers all working with the same policy. Complicating all of this is the fact that although the insurance carrier may report four brokers they still report only ONE premium figure, which we have tied to each of the four brokers. If you select �Repeating/All Brokers� you will be exporting some of the same Premium and Lives Covered figures twice, which will artificially inflate your results. By selecting �Unique/First Broker Only� you will only export one broker per policy, and avoid any double-counting issues, but you will not see as complete a picture of the broker community. MSA � Metropolitan Statistical Area. This is the smallest geographic region breakdown, and often correlates to a city. PSMA � Primary Metropolitan Statistical Area. This is a larger geographic region than an MSA, and is mutually exclusive of MSA entities. CMSA � Consolidated Metropolitan Statistical Area. This is a combination of PMSA regions.